PROS/CONS: We considered position on both growth hormone rbST and GMOs, number of additives and thickeners used, whether or not it contains milk protein concentrate, whether a full-fat option is offered, non-sale price of single serve container (we visited 3 stores in Santa Barbara, CA. to compare), and availability of organic ingredients. ADDITIVES: A list of additives contained in the various varieties from this brand. We did not include the ingredients of the “base/plain” yogurt here as they are already listed above. Also not included is the main ingredient specific to the flavor. For example, you will not see “strawberries” for Strawberry Chobani yogurt here, only the additives in addition to strawberries. Note that not all the additives listed here are found every container. Coloring agents, thickeners, and preservatives vary based on the specific flavor. 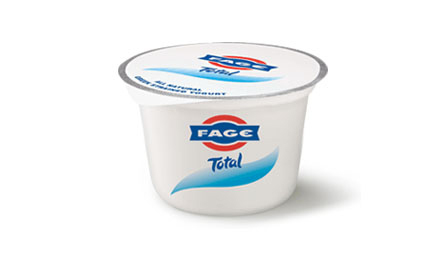 Fage earns the top spot in our brand comparison. It has all the fat varieties (full, low and non), offers flavors within each fat option, uses very minimal additives, and no rbST. This is true Greek-style yogurt at it’s best. All Fage (“fa-yeh” for anyone wondering) flavors are stored in a separate container which is attached to the main plain yogurt container. Fage does not post their ingredients online, but we called their customer service for the information and checked all the varieties we could find at the grocery store. Price: $1.89 – $1.99/single serving container. PROS: no milk protein concentrate, no thickeners in plain varieties, no rbST, many full fat and low fat options, separate flavor container which is great since you can add as much or as little as you like. Voskos and Yo Greek are owned by Sun Valley Dairy. Voskos offers all fat options (full, low, non) and also has a non-fat organic version. 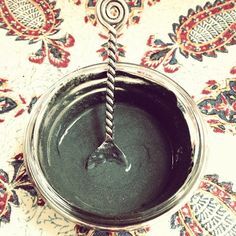 While it appears they use many thickeners, most varieties only include one thickener (they use different thickeners for different flavors). Kukos for having a “No GMO” stance in all their products. 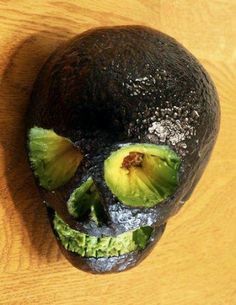 Would be great if they offered a full-fat organic variety. Most fruit flavors are blended into they yogurt. 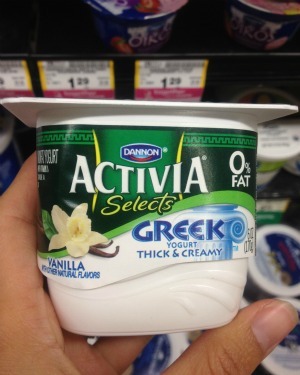 Yo Greek is non-fat, flavored yogurt which has a separate container for granola. 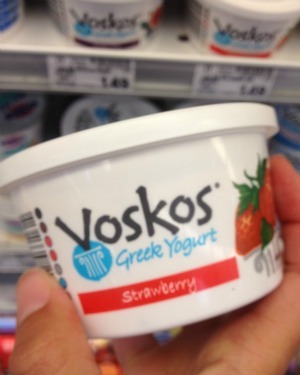 Voskos Price: $1.49/single serving container. The beauty of Stonyfield is that it is all certified organic which means organic fruit, no rbST, no antibiotics and dairy cows fed organic feed. It’s a bummer that they only offer non-fat varieties. Fruit on the bottom. Groupe Danone is parent company (they own 85% of Stonyfield). 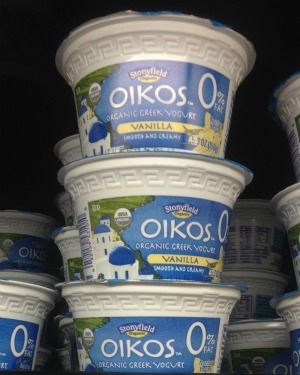 While both Stonyfield and Dannon share the “Oikos” name, they use separate yogurt formulations. Price: $1.99/single serve container. 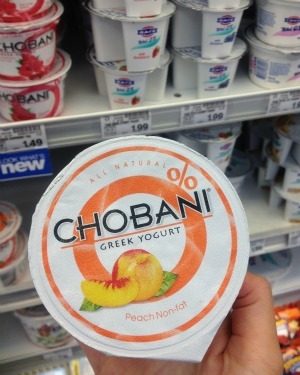 Chobani is currently the number one yogurt in America with a whopping 10% market share. It’s safe to say that consumers were tired of the all the crappy yogurt, took one bite of Chobani and were hooked. Chobani lost points for not offering a full-fat variety (Stonyfield edged out for 3rd place for being all-organic). The flavored varieties feature fruit on the bottom. Price: $1.59-$1.99/single serving container. PLAIN: Cultured pasteurized nonfat milk, cream (in low-fat varieties only), live and active cultures: s. thermophilus, l. bulgaricus, l. acidophilus, bifidus, l. casei. 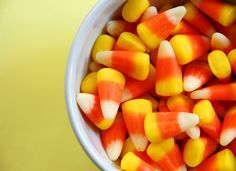 ADDITIVES: fruit on the bottom – evaporated cane juice, cherry juice concentrate, pectin, locust bean gum, natural flavors, tumeric, locust bean gum, fruit & vegetable juice concentrate. 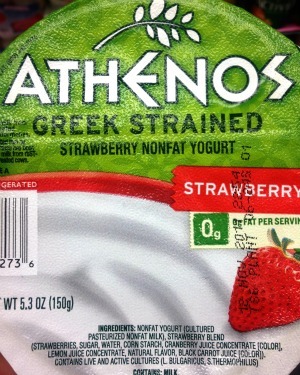 Athenos is easily recognizable at the store due to it’s unique, ultra-flat shape. Like Fage, Athenos offers a separate flavor container. After a bit of searching on their (very cool) site, we learned they are owned by Kraft Foods. 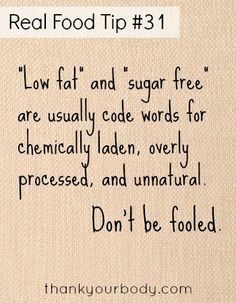 As with several of the other brands, they use very few additives, but only offer non-fat varieties. Price: $1.59/single serving container. 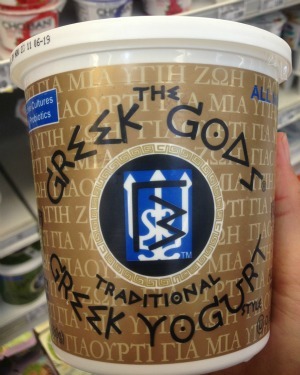 The Greek Gods yogurt is independently owned. They have two fat options, but even their plain varieties contain a thickener. Price: $1.99/single serve container. Dannon Oikos has two varieties: Non-Fat with fruit on the bottom and Traditional (only in key lime, strawberry, raspberry) with flavors stirred in. They share the same parent company as Stonyfield, Groupe Danone. While both Stonyfield and Dannon use the “Oikos” name, they have separate yogurt formulations. Price: $1.29/single serve container. 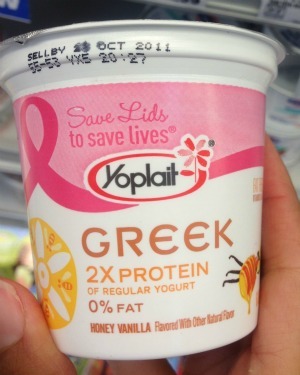 Yoplait Greek, owned by General Mills, only offers non-fat Greek yogurts. Due to the fact that Yoplait does not show their ingredient list online, this may only be partial information based on what we could physically see in the store. The price point is really the only positive attribute to this brand. Due to their use of milk protein concentrate, they fell to the bottom end of the list. Fruit on bottom. Price: $1.29 – $1.39/single serving container. All small images by Be Food Smart – Sorry for the low cell phone quality! Main image from Fage website. Dina, I love the yogurts from Straus Family Creamery – local, organic, sustainable. (http://www.strausfamilycreamery.com/?id=25) I use it in all my recipes calling for yogurt. For frozen yogurt, I strain it to make it thicker. 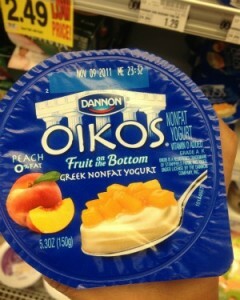 I’ve never had any of the Greek-style yogurts listed here. Used Straus in my blogpost today – homemade granola and granola parfaits. Very helpful comparisons, thanks!! I find some of the “greek” products so watery and sweet that I can’t tell them from the companies’ “regular” product. I was impressed that my taste matched the majority of your poll respondents’ as to favorite! 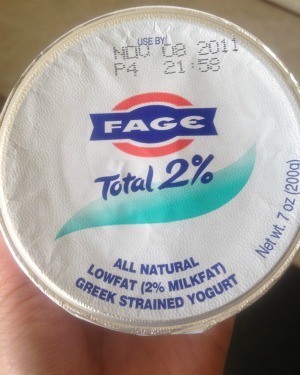 Glad, also, to see that Fage ranks right up there as to additives, rBST and so on. If I had a local producer like Strauss, I would for sure support them; unfortunately I do not, so Fage from my local stores is mostly a go-to item for us. I really like that they separate the flavoring so you can consciously use or not use as much of it! Hi Linda – Thanks for your kind words! The brands do vary wildly when it comes to thickness. I’ve been making a home-strained Greek yogurt from large tubs of whole-milk yogurt at home and I must admit, that I have both over-strained and under-strained through my experimentation. I would encourage you to try it! It is super easy and you can probably do it with stuff you already have in your kitchen. Check out this blog post on it: How to Strain Your Own Greek Yogurt. I recently bought some cheesecloth which I like because it is reusable. You’ll save money too. Let us know if you try it!